Monogram size is approx. 3.8" high x 5.1" wide ~ Perfect for Towels! Template File Instructions are included in the Chart Document. 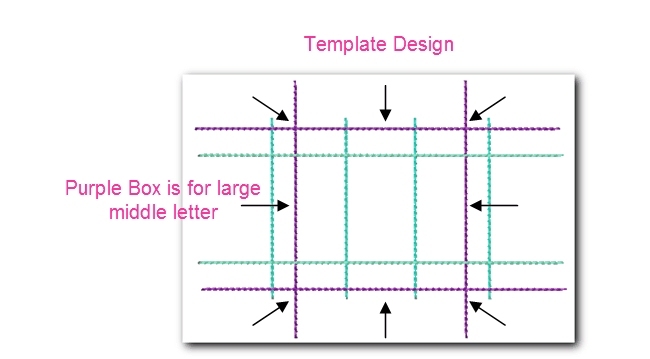 Template File Pictures - Full instructions are included HERE in the Chart Document, but these pictures show what the template file looks like and where to place the letters to get the best placement. This monogram is beautiful. It was easy to purchase online and download to my computer. The step by step downloading instructions provided by DK Designs were especially helpful! Lines up well with the template provided and looks beautiful on my products. love this font, I used it on a tote and it turned out beautiful, thanks for a great design. First time I purchased a font and so glad I made this selection. Beautiful on sweatshirts and towels. Wonderful quality withou spending a lot of money. 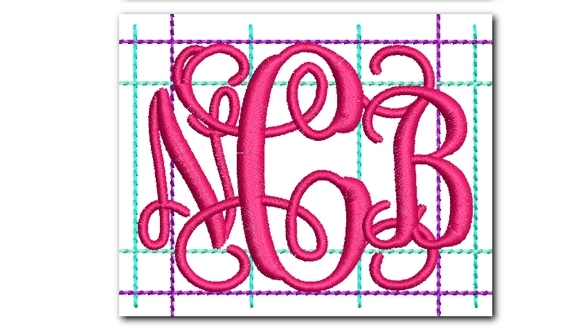 After almost being in tears from trying different monograms, I found this one. It stitched up beautifully the first time and every time thereafter. I will be back to look for more at this website. I really enjoyed this design and it was easy to apply and alignment was perfect. Beautiful. I loved how this sewed out. I was in need of a monogram font for a wedding project. I just loved how they turned out. Love this font. Very elegant and dresses up the plain shirts great!! I have the smaller size of this. Purchased the 4 and 5 inch size for pillows. I'm sure they will stitch out just as nice.